A group of SDSM&T students received grant dollars to teach middle school students about the various types of engineering fields and the opportunities associated with each. Each Wednesday, the group works with students in the 8th grade Career Exploration class at North Middle School. The first week, SDSM&T students taught the middle schoolers about mining. Students mined chocolate chips out of a cookie. They were paid for each mined chocolate chip and were rewarded for the cookie that was the least damaged. Students received a safety bonus if they did not break their mining equipment (a toothpick and a paper clip). The second session focused on chemical engineering, including chemistry and biology. 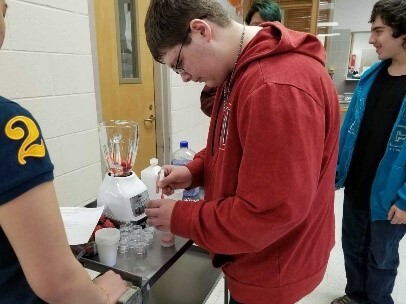 SDSM&T students arrived with blenders, fruit, soap and rubbing alcohol. The 8th graders were divided into groups and participated in DNA testing of the two fruits. The third session exposed students to environmental engineering, civil engineering, and physics. The students created spaghetti and marshmallow structures as well as catapults and figured out a trajectory to shoot ping pong balls into a bucket. The final sessions are on electrical engineering, computers and technology. For the activity associated with this field, SDSM&T students will bring small robots, robotic arms and virtual reality items. Mrs. Leatha Roland’s Career Exploration students are thankful that the School of Mines & Technology students and professors shared their knowledge and time!